Here at Pybus Opticians, we pride ourselves on ensuring that every customer receives the best possible service every time. We will spend the time with you to fully understand your eye care needs, starting with our thorough 30 minute eye examination (compared to 20 minutes you might get at some other high street opticians), where we take the time to listen to your problems, explain our findings and advise you on the all the options. Right through to the fantastic dispensing team, who will ensure you have the best possible experience and are dispensed with the best frame and lenses for your needs. We offer many specialist services that you just don’t get in the large, multiple opticians, such as Colorimetry, Dry Eye Assessment and Domiciliary Home Visits (we even continue caring for your eyes, when you’re no longer able to get to us). Because we are an independent, family run opticians, we are able to supply a wide variety of frames, lenses and contact lenses, so we should have something for everyone. Our staff aren’t on commission and they will spend as much time as you need to ensure you get the perfect pair of glasses for you. If you like to know who will be caring for your eyes, then Pybus Opticians is the perfect place for you. Unlike some large, multiple opticians where you will often be seen by different people every time you visit, you will always see the same friendly faces here at Pybus Opticians and for those of you who we visit at home, you can rest assured that you will see the same friendly faces too. Seeing the same Optician and Dispensing Optician allows us to build up a history of your eyes, which in turn enables us to detect changes and potential diseases at an earlier stage. The team here has between us over 50 years experience at this practice (I know, we don’t look old enough!!). Over this time, we have built up many long-term relationships with our patients and we will continue to build these relationships in the future. Our dispensing team consists of a fully qualified dispensing optician and an experienced dispensing assistant. This ensures that you will always see knowledgeable staff who can give you accurate information about lenses and great fashion advice regarding frames. And if nothing else, then choose independent and help Canterbury’s local economy! Did you know that for every £1 spent with a local, independent business, between 50p-70p circulates back into that local economy. Shopping online or in corporate, out of town retailers only generates around 5p back into the local community. Don’t just take our word for it, a Which? survey of more than 5,000 members back in 2014, rated local independent opticians as the best place to buy your glasses. Local independent stores came top overall with a customer score of 88%. Independent opticians were the only stores to achieve top ratings for customer service, staff skill and communication. 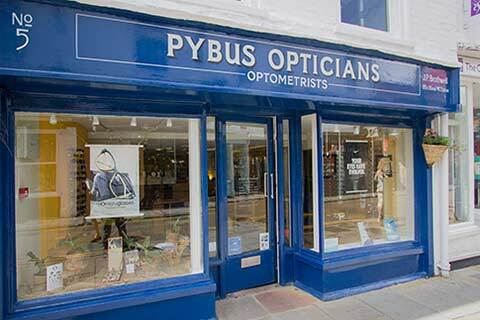 So, if you’re looking for an independent Opticians, who cares about your eyes and takes the time to understand your needs, come along to see us at Pybus Opticians, your local independent eye specialist in Palace Street, Canterbury.